Robin Thompson and Kirk Langman, Operations Manager for Instructor-Led Training for Thomson Reuters Tax & Accounting, talk about Gear Up CPE Conferences, particularly Royal Flush and Magic Week fall CPE conferences. 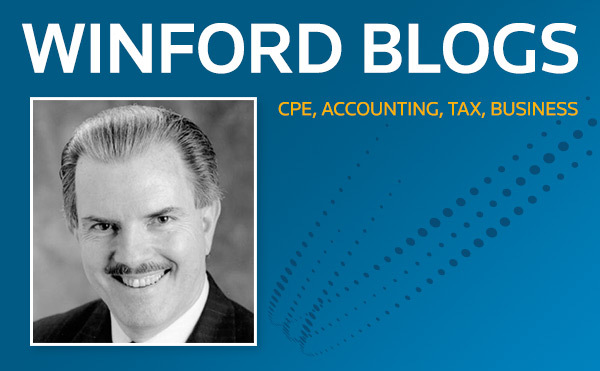 Hear about what’s new for fall 2012 and what makes these week-long CPE conference events so popular with tax and accounting professionals. Robin Thompson and Ken Koskay, vice president for Learning Solutions in the Tax & Accounting business of Thomson Reuters, talk about the 70+ new Checkpoint Learning courses and webinars launching in 2012. With the national and local elections process in full swing, political contributions and participation in the political process are regular topics on the evening news. The dramatic increase in the amount of money being donated to and spent by the national campaigns is staggering. During the last major election, I wanted to be part of that process, so I donated ten dollars to one of the major parties. They took my ten dollars, added fifteen dollars to it from some other donor, and then spent the combined twenty-five dollars trying to get me to donate ten more dollars. That is the worst business model I have ever seen, but I guess it works on some folks. My contribution was not tax deductible; however, it was legal. Donations to a political organization by churches and other nonprofit organizations (NPOs), on the other hand, are strictly prohibited by Internal Revenue Code Section 501 (c) 3. The Code also prohibits churches and other NPOs from directly or indirectly participating in, or intervening in, any political campaign on behalf of (or in opposition to) any candidate for elective public office. Any church or other nonprofit organization violating this prohibition risks losing its tax-exempt status. The Internal Revenue Service does, however, provide resources to help these organizations understand the rules. 2. Contribute to political candidates or political action committees. 3. Participate in fund-raising projects for political candidates. 4. Distribute a candidate’s political statements. As part of its examination program, the IRS monitors whether organizations are complying with the prohibition. When the agency finds or is made aware of instances of noncompliance it may issue a warning letter or it may revoke the entity’s tax exempt status. While the IRS has issued hundreds of warning letters intended to stop advocacy for political candidates, it has only revoked a church’s tax exempt status twice since the tax law was amended in 1954. Certain activities or expenditures may not be prohibited depending on the facts and circumstances. 1. Conduct non-partisan voter registration/education drives. 2. Host forums where all candidates are invited and treated impartially. 3. Rent a church or other NPO membership list (at market value) to a candidate. 4. Make voter’s guides available to members so long as the guides do not reflect a partiality which could be misinterpreted as an endorsement of a particular party or candidate. 1. The first recorded tax exemption for churches occurred circa 312, when Constantine, Emperor of Rome granted the Christian church exemption from all taxation following his conversion to Christianity. 2. In 2010 the State of Oklahoma awarded tax-exempt status to a Satanist group called The Church of the IV Majesties. 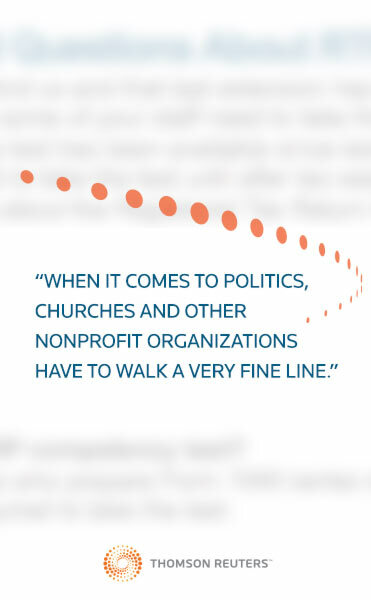 When it comes to politics, churches and other nonprofit organizations have to walk a very fine line. While the prohibition for organizations does not apply to members, a member must be careful to inform an audience that he or she is speaking as a citizen and not on behalf of the organization. Congress passed legislation that extends the 2% employee payroll tax cut for another 10 months without significant tax offsets. As you may recall, the 2-percentage point cut was slated to expire on March 1, 2012. The bill also extends federal unemployment insurance benefits and prevents a scheduled cut in payments to Medicare providers from occurring during the remainder of 2012. The President signed the payroll tax cut bill on February 22. Last week, the President submitted his Fiscal Year 2013 budget and revenue proposals. It will be interesting to see what happens to these proposals as they work their way through Congress. Since it is an election year, it is sometimes difficult to predict how Congress will react to proposals from the White House. In contrast to the rancor and political skirmishes that occurred on Capitol Hill in 2011 when Congress debated raising the federal debt ceiling limit and when Congress extended the 2% payroll tax cut for two months at the end of December 2011, last week seemed relatively calm inside the Beltway. For a couple of days, I thought that there was a big snow storm on the East Coast and that the Washington had shut down due to wintry weather. Instead, members of both parties decided to work towards a common goal—their re-election. Although it is an election year, most individual taxpayers are more concerned about the filing deadline for their Form 1040. By now, taxpayers have received most of their 1099 forms. Some of us have also had the privilege of receiving a 1099 in their mailbox and an email later that same day from the payer indicating that an amended 1099 is going to be issued by the end of February. One point for the procrastinators who do not file their tax returns too quickly. The full brunt of the busy season has arrived. 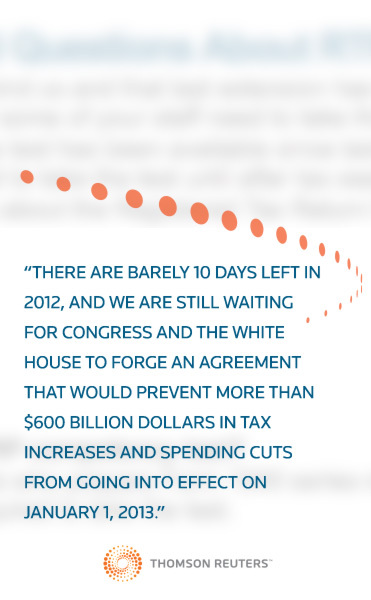 Luckily, there was not a lot of major tax legislation in 2011. This is unlike the previous tax season where tax legislation was passed into law during a lame duck session of Congress in late 2010. 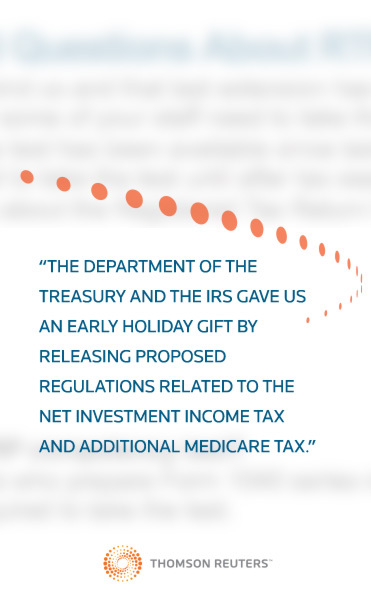 The final 2010 federal tax forms were released later than normal as a result of that last minute legislation. The companies that produce tax preparation software are probably breathing much easier this year. If I were a betting man, I would say that they will not be so lucky next year. Speaking of tax form changes, some taxpayers have probably noticed line 1a, Merchant Card and Third-party Payments, in Part I on Schedule C (Form 1040). For 2011, the IRS deferred the requirement to report gross receipts received via merchant cards (credit and debit cards) and third-party network payments on line 1a. Taxpayers are supposed to enter zero on line 1a for 2011 and report all gross receipts on line 1b, including any income reported to them on Form 1099-K. It will be interesting to see what legislative and regulatory changes will occur in this area before the 2012 federal tax returns are filed in 2013. As always, the lobbyists will be busy. In addition to the line for merchant card and third-party payments, taxpayers may have noticed some changes to Schedule D (Form 1040) this year. In general, taxpayers reporting 2011 capital gains and losses will first report the gains and losses on the new Form 8949, Sales and Other Dispositions of Capital Assets. The totals from Form 8949 are then carried over to Schedule D. Once there, the taxpayer will be on more familiar ground. While preparing their Form 1040, some taxpayers may notice that the Making Work Pay credit has disappeared. This credit expired and cannot be claimed on the 2011 federal individual tax return. The 2% employee payroll tax cut might reduce the sting of no longer having the Making Work Pay credit, but most taxpayers would prefer having both benefits. How do you keep up with these changes? For those individuals with Smartphones, the IRS recently announced the availability of their updated Smartphone application, IRS2Go 2.0. This is an expanded app designed to provide taxpayers with easier access to tools and information. The new app is available for both the Apple and Android platforms. It has a new YouTube feature, news feeds, and tax transcript service. You can also check the status of your refund using the app. Last week, there was another item of interest from the IRS. The Service issued its annual “Dirty Dozen” ranking of tax scams. There were no big surprises. Number one on their list was identity theft, and number three was return preparer fraud. The Preparer Tax Identification Number (PTIN) requirement and Registered Tax Return Preparer (RTRP) program should help reduce return preparer fraud in the future. Many articles in the print and electronic media have started to educate taxpayers about seeking qualified tax preparers and asking for their PTIN. One last item came to my attention this morning. There is a lot of talk in Washington about corporate tax reform. There is also some talk about individual tax reform in speeches by various presidential candidates. However, most tax professionals are currently concerned with filing 2011 tax returns. By April 17, many of us will have formed our own opinions on how to best reform the tax system, but the various tax provisions that expire at the end of 2012 will be foremost in our minds. It looks like the real fun begins when the lame duck session of Congress carefully deliberates how to handle that issue after the general election in November.